Serves 4, preparation time 15 mins, cooking time 0 mins. 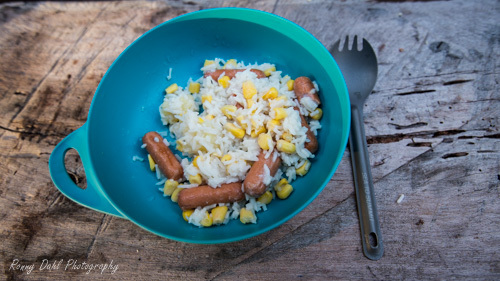 A very easy cold meal to fix up before or at camp and will fill you with energy. Great for kids and pretty healthy too IF you cut back on the mayonnaise (but tastes way better with all that mayo). Everything can be pre-chopped apart from the apple as they will turn brown. 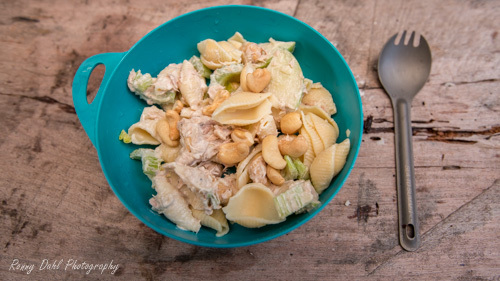 There is no real order of mixing all the ingredients but does seem to work better by mixing everything apart from the pasta and then adding the mixture to the pasta by giving it a bit of a salad toss. Add salt & pepper for tasting. Enjoy! Serves 4, preparation time 1 min, cooking time 7 mins. Nothing fancy here but still very tasty and extremely easy to make. I actually made this for the first time when we ran out of food on a family trip and have since been making repeats of it. This meal will be ready in 15mins including 5mins of heating the meal. Prepare the rice first by adding 60-90ml of water (depending on what the packet says), if there is no heating in the pan instructions add 90ml of water. Add the 3 table spoons of coconut milk and proceed heating the rice for 4-5mins being careful not to burn the rice. Once the rice is ready add the other ingredients (cocktail franks, corn and pineapple) gently stirring avoiding mashing the cocktail franks until it’s hot. About another 5 mins. If you don’t like the cocktail franks you can add pork or chicken chunks instead. Add salt & pepper for tasting. Serves 6, preparation time 10mins, cooking time 5 mins. 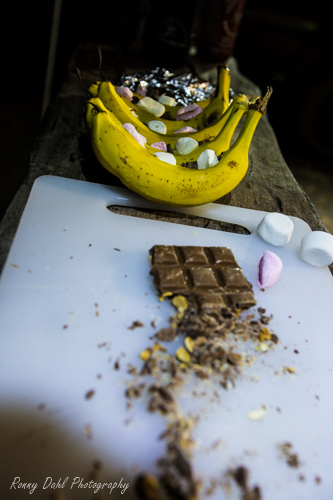 One of the best deserts you will encounter at a camp, anyone with a sweet tooth will be drooling from the mouth over this one! This is so simple to cook, all you need are 6 bananas still in the peals and cut 10-15mm from each end of the banana being very careful not to cut past the peal on the other side. 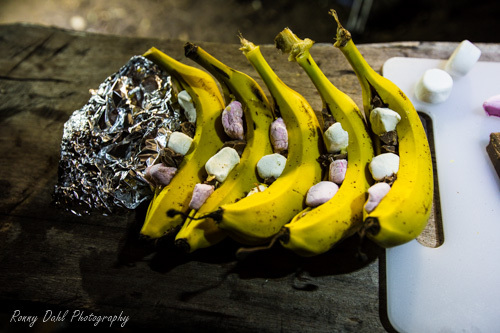 Once prepared stuff each banana with chocolate and marshmallows carefully wrapping them up in foil tightly at each end but losses at the middle over the top of the bananas. To eat simply scoop the banana mixture out with a small spoon. Enjoy your easy camping meals! Leave Easy Camping Meals And Go 4 Wheeling In Western Australia. Go To Camp Cooking Recipes.